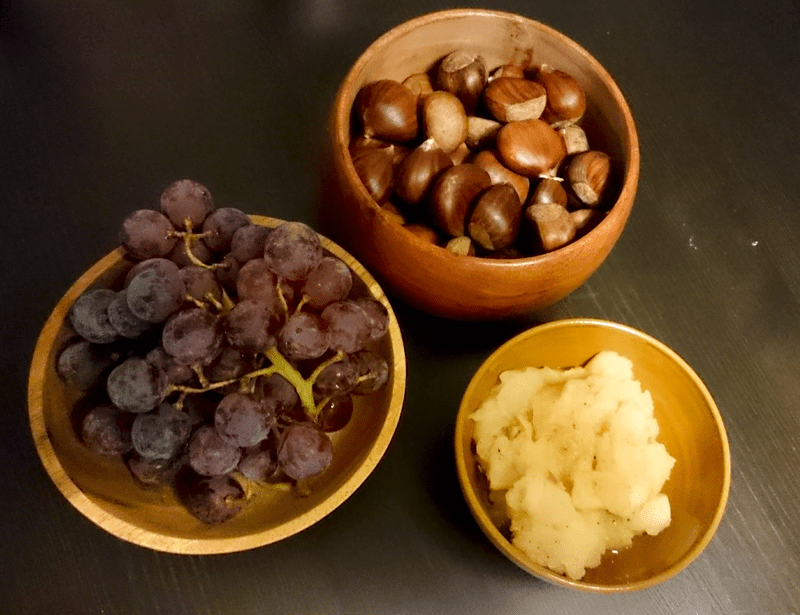 I hosted a renaissance dinner party for a few friends where I served game pie, pumpkin puré, bread, grapes and a chunky apple jam. As I have talked about before I am planing a medieval & renaissance inspired larp dinner. I just started testing out recipes. Thursday night I had a friend over who will be part of the event so that was a good chance to test out a few recipes. I made a game postej (or game pie) and a pumpkin puré. I had brought some diced game meat and a pumpkin among a lot of random other things that day without quite checking the recipes, so I made some adjustments. So what I ended up making was inspired by and based on period recipes (both from the renaissance) but I wasn’t quite following them. I also had some old apples that I cooked into a spicy apple compote using period spices. I had so much fun in the kitchen cooking up a storm and both my partner and my friend loved it. The game pie will definitely be part of the larp menu. 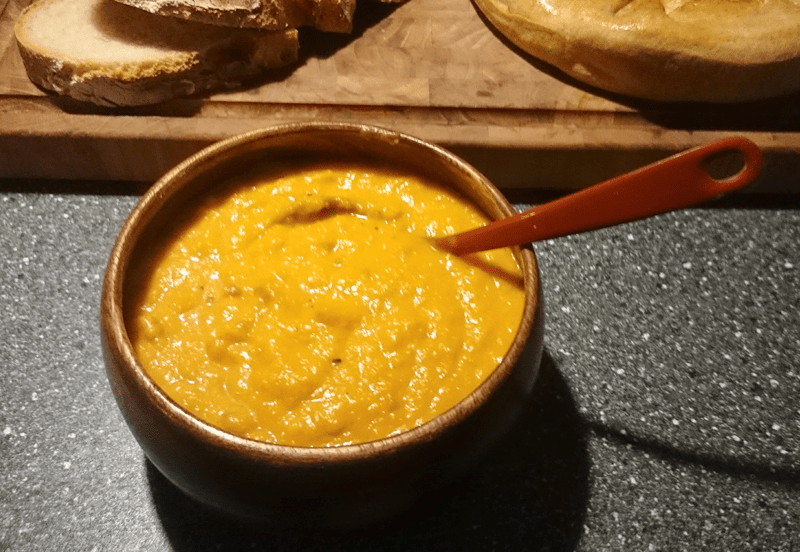 The pumpkin puré is based of Bi Skaarup’s “Græskar at koge” in Renæssancemad. My only adjustment is the regular breadcrumbs are substituted for gingerbread breadcrumbs as I didn’t have any white bread and wanted to use spices in the puré anyway. I had seen gingerbread used as breadcrumbs in other main course recipes. It turned out to be a very tasty addition to the dish. The original recipe is from Anna Wecket’s cookbook “En artig oc meget nyttig Kogebog…”, 16481“En artig oc meget nyttelig Kogebog udi hvilcken korteligen er befattet, hvorledis adskillige slags konsterige Rætter…beredis skal : Oc nu den gemene Mand til beste paa Danske”, sometimes know as “Ældste danske kogebog”. A pumpkin spicy puré based on a recipe from Anna Wecket's 1648 cookbook. Works well as a side dish with meat dishes. Peel, de-seed and dice the pumpkin. Boil the pumpkin in the milk at a low heat until the flesh is mashable. That takes 10-20 min depending on how big your dices are. Make sure the milk don't burn or overflow. Grained the safran in a mortar and add a tablespoon of boiling water and let it sit for a bit. Take the pumpkin off the heat and puré the pumpkins with a wooden spoon or use a potato masher in the milk. You can of course use a blender but that might alter the consistency. Put it back on the heat and add the breadcrumbs. Let it simmer for 5 minutes while it gets a bit thicker. If it is still very runny add more breadscumbs. Add the butter and salt to a taste. A “postej” is a pie in old danish. This pie is a mix of a number of recipes – all of them period appropriate. Pies were a common part of the wealthier table from the medieval kitchen and up until the 1800’s in Denmark. I have not made a postej before, so I am pleased as pie, that it turned out really well. The process is a bit complicated as it involves two different crusts and a filling made separately, but the result is quite good and resultat is well worth the time. The two different doughs for the crust need resting for at least an hour but they both freeze well. The base crust is the easiest pie crust I have made so far. You can make a simpler version by using a casserole dish instead of the base dough and just add a short crust lid to the dish. It should be good, but doesn’t look as impressive. The dish can be made well in advance and be served either hot or warm or at room temp. You need a batch of short crust for the lid and a batch of pie crust fro the rest of the pie crust. 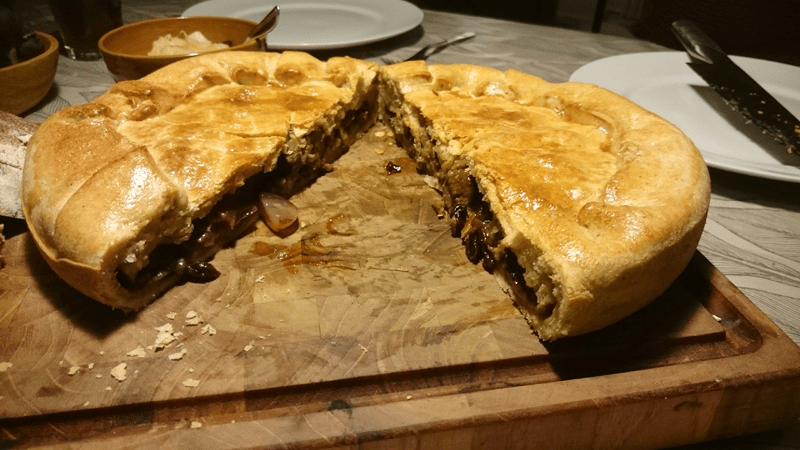 A medieval inspired game pie with grapes and raisins, perfect for a medieval feast or a dinner party. So, add all the spices to the meat (you can use many more if you want). Melt the butter in a pot, add the onion and meat and brown it. Roll out the base crust and place it in a cake tin with a loose bottom. Let it hang over the edges for now. Put in half the grape and raisin mix. Roll out the shortcrust (it don't have to be all that thin) and cut out a circle that fits the size of your tin and place it over the filling. Fold over the base crust over, so there is an overlap. You can now decorate the top of the lid with pretty shapes of shortcrust if you feel creative. Brush the lid and the edges with a mixed egg. Bake at 200 C (375 F) for about 35-45 minutes until the crust is golden brown. You need a batch of short crust for the lid and a batch of pie crust fro the rest of the pie crurst. The spices and the instructions for the filling is also printed in “Historisk Kogebog” af Else-Marie Boyhus but is originally from Haldahl’s cookbook from 1883.